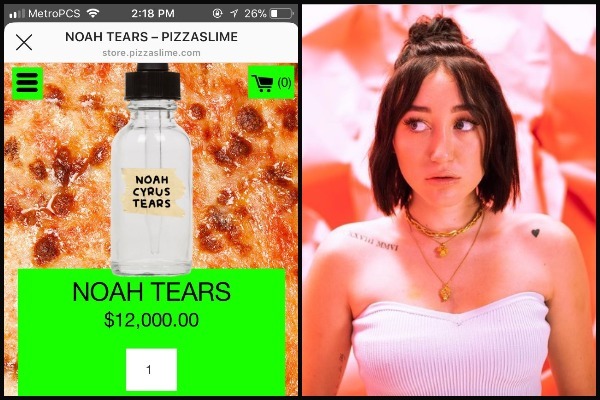 A mere joke by Noah Cyrus at launch of EP Good Cry that she will sell bottle of her tears for $12,000 is turned into a scam. Miley Cyrus sister Noah Cyrus’ funny advertisement at her new music launch Good Cry soon became an internet sensation that she is selling bottle of her tears for a staggering $12,000 after break-up with Lil Xan. Ahead of her new release titled “Good Cry,”18-year-old pop star collaborated with clothing line website Pizzaslime to promote her new launch in unique way. She put her emotions on sale for 48 hours, after her recent public split with Lil Xan, labelled as “Noah Cyrus Tears” for an exorbitant price of USD 12,000(AU$16,454). It was purely meant for humor and an unique idea to promote her fake tears for the new upcoming release, without giving a thought that anyone would actually click on such an absurd gag offer. The promotion of her tears on Pizzaslime site which was ONLY for fun and not real, soon started to place real orders on the site. i'm so excited that it's finally out for the world to hear. the #GoodCryEP means so much to me😢🖤 it’s a good time to become friends with your emotions. love you cyrens. There are other Noah Cyrus related merchandise including hoodies, sweatshirt, mugs and more selling for real on the website. 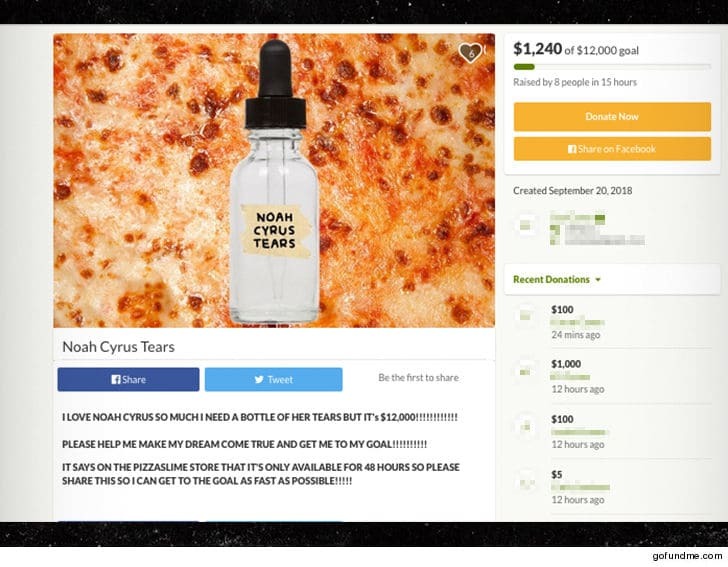 Soon after the bottle of Noah’s tears made its online debut, scammers grabbed an opportunity to fool people and literally started a GoFundMe campaign to collect the $12,000 from people, saying they want to buy a bottle, something that is not even real. You can see in the above image that the scammer have already collected $1,240 in just 15 hours. When Noah’s team got the news of such scam going around, they cleared the air and told that there is no such bottle of tears been sold. You will NOT get an actual bottle and the money charged to your account WILL be refunded. Conclusion, there is no such bottle of tears Noah is selling, and, guys, use your brains before funding such campaigns.